The 12th Finance Commission has made a series of major fiscal recommendations, including raising the share of states from the divisible pool of resources to 30.5 per cent from the existing 29.5 per cent and called for doing away with the present system of central assistance to state plans in the form of grants and loans. The scotch controversy generated by Tourism Minister Renuka Chowdhury stopping the supply of the premium Jonnie Walker Black Label at the duty-free shops seems to be headed for the worst with the minister seeking a fresh CBI probe and Tourism Secretary Uma Pillai stating that she would take up the matter at an “appropriate forum”. 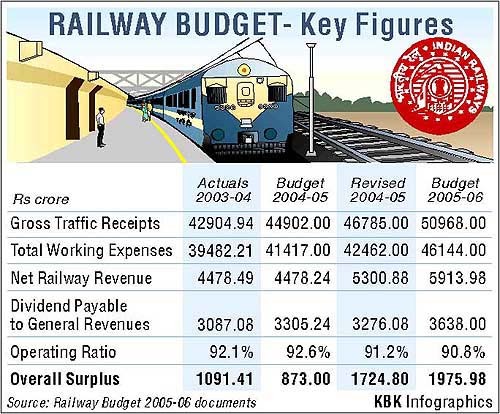 The industry today welcomed the proposals announced in Railway Budget 2005-06. President of the Federation of Indian Chambers of Commerce and Industry Onkar S. Kanwar described as “innovative” the reforms initiated by the Railway Minister, which will make the Railways “a much more freight customer-friendly organisation”. The Railways earned 62 paise of each rupee from freight charges during 2003-04 and 30 paise from the movement of passengers. According to the Railway Budget presented today, the ministry spent 2 paise towards development fund of Railways in 2003-04. Railway Budget 2005-06 has proposed 75 per cent concession in second class fares for girls from rural areas studying in government schools to enable them to attend national-level entrance examination for medical, engineering and other professional courses in colleges. 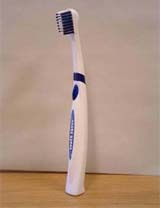 This photo provided by Hasbro Inc shows "Tooth Tunes", Hasbro's new musical toothbrush that transmits music through the jawbone to the ear when its bristles touch teeth. The recent amended rules for delayed or cancelled flights by the European Commission are likely to cause a further turmoil in the airlines industry. According to the new rules, the passengers flying into and out of European countries are entitled to heavy compensation in cash and kind for the inconvenience caused to them for delayed and cancellation of flights. Q: Please advise on the following query:We have ancestral agriculture land in our village in Haryana, which was in the name of our grandfather (who expired in 1967) and has recently been transferred in the names of our father and uncles as per their share. Significantly, it also linked debt relief to states to fiscal reforms and suggested the adherence to similar terms and conditions as adopted by external funding agencies while providing central assistance to states. It has also asked the Centre not to act as an intermediary for future lending to states except in the case of weak states, which are unable to raise funds from the market. The report, which was tabled in Parliament today, has recommended a total transfer of states to Rs 7,55,752 crore. Of this, transfers by way of share in Central taxes and grants-in-aid amount to Rs 6,13,112 crore and Rs 1,42,640 crore, respectively. The present system of central assistance for state plans comprising grant and loan component is to be done away with and the Centre is to confine itself to extending plan grants and leaving it to states to decide their borrowings. With the recommended scheme of debt relief in place, fiscal reform facility is to be discontinued over the period 2005-2010. The central loans to states contracted till March 2004 and outstanding on March 31, 2005 amounting to Rs 1,28,795 crore are to be consolidated and reschedule for a fresh term of 20 years and an interest rate of 7.5 per cent to be charged on them. This is subject to enactment of fiscal responsibility legislation by a state. A debt write-off scheme linked to reduction of revenue deficit of states is to be introduced. Under the scheme, repayment due from 2005-06 to 2009-10 on central loans contracted up to March 31, 2004 will be eligible for write-off. The total transfers recommended by the 12th Finance Commission are higher by 73.8 per cent over those recommended by the earlier commission. Within the total transfers, while the share in Central taxes is higher by 62.9 per cent, grants-in-aid recommended by the commission is higher than those made by the preceding panel. The devolution formula, the report says, “balances equity with fiscal efficiency.” “Equity considerations, however, dominate, as they should, in any scheme of federal transfers trying to implement the equalisation pricing. As per the recommendations, Uttar Pradesh will receive the highest share will be received by Uttar Pradesh (19.264 per cent), followed by Bihar (11.028 per cent), Andhra Pradesh (7.356 per cent), West Bengal (7.057 per cent), Madhya Pradesh (6.711 per cent), Rajasthan (5.609 per cent), Tamil Nadu (5.305 per cent), Orissa (5.161 per cent), Maharashtra (4.997 per cent), Karnataka (4.459 per cent), Gujarat (3.569 per cent), Jharkhand (3.361 per cent), Assam (3.235 per cent), Kerala (2.665 per cent), Chhattisgarh ( 2.654 per cent), Punjab ( 1.299 per cent), Haryana (1.075 per cent), Uttaranchal ( 0.939 per cent), Himachal Pradesh ( 0.522 per cent),Triupura (0.428 per cent), Meghalaya (0.371 per cent), Manipur (0.362 per cent), Goa ( 0.259 per cent), Arunachal Pradesh (0.288 per cent), Nagaland ( 0.263 per cent), and Mizoram ( ( 0.239 per cent). It also recommended that a grant of Rs 20,000 crore for the Panchayati Raj institutions and Rs 5,000 crore for urban local bodies is to be given to states for the period 2005-2010. The scheme of Calamity Relief Fund is to continue in the present form with contributions from the Centre and states in the ratio of 75:25. The size of the fund has been worked out at Rs 21,333 crore for the period 2005-2010. The outgo from the fund is to be replenished by way of collection of National Calamity Contingent duty and levy of special surcharges. The report calls for improving the tax-GDP ratio to 17.6 per cent by 2009-2010. The combined debt to GDP ratio, with external debt measured at historical exchange rate is to be brought down to 75 per cent by 2009-10. Fiscal deficit to GDP target for the Centre and states is to be fixed at 3 per cent. The revenue deficit of the Centre and states is to be brought down to zero by 2008-2009. Interest payments relative to revenue receipts are to come down to 28 per cent and 15 per cent in the centre and states respectively. The Finance Commission has suggested that states should follow a recruitment policy in a manner so that the total salary bill, relative to revenue expenditure, net of interest payments, does not exceed 35 per cent. Each state is to enact a Fiscal Responsibility legislation providing for elimination of revenue deficit by 2008-09 and reducing fiscal deficit to 3 per cent of the state domestic product, the report said. The scotch controversy generated by Tourism Minister Renuka Chowdhury stopping the supply of the premium Jonnie Walker Black Label at the duty-free shops seems to be headed for the worst with the minister seeking a fresh CBI probe and Tourism Secretary Uma Pillai stating that she would take up the matter at an “appropriate forum”. In an apparent attempt to shift the focus from her the minister has now asked the investigating agency for an “independent” inquiry based on the “facts and documents” from the India Tourism Development Corporation (ITDC). The minister had also launched a vitriolic attack on the Tourism Secretary in an interview with a national daily which reflected her in bad light. On the other hand, the Tourism Secretary, who had opposed the minister’s move to appoint an independent supplier rather the supply coming directly from the UDV Company, the manufacturers of Black Label, has said that all the charges against her are false. She said today, “The charges are incorrect. I am bound by the code of conduct for government servants. I will take it up at an appropriate forum”. Caught in a controversy over the large-scale transfers in her Ministry and ITDC, Ms Chowdhury had reportedly charged Ms Pillai with misusing her official position. “Why are you blaming me? Why can’t you turn your gaze at the Secretary? She has her cook, gardener and even dhobi from the ITDC,” the minister had said. She has now sought a fresh probe on the grounds that the earlier probe by the CBI was based on the report given by the ministry’s Chief Vigilance Officer Amitabh Kant, who was also the Chairman and Managing Director of ITDC and member of the Purchase Committee. He has since been divested of the post of CMD. The CVO’s report was given to the CBI “without examination and even reference to the minister,” and the CBI had found that there was no case for further inquiry. Mr Kant had also opposed the ministry’s interference in the purchases made by the ITDC saying that there were no rules for that. Ms Pillai was recently transferred to Department of Ayush, under the Ministry of Health, and would take charge at the new office on Monday. In her attack on the Tourism Secretary, the minister had also said Ms Pillai was not leaving her ministry and was “shamelessly sitting on the chair”. Declining to get into the charges levelled against her, Ms Pillai said she was looking forward to her new assignment in the Department of Ayurveda, Yoga and Naturopathy, Unani, Siddha and Homeopathy. Officials at the ITDC while commenting on the shortage of Black Label said that there was enough stock of whisky at other stations and the shortage would be taken care of. Reports here said that UDV had supplied 17 containers of Johnnie Walker Black and Red Label whisky worth Rs 14 crore during the last general elections “without following the required procedures and necessary documentation”. The industry today welcomed the proposals announced in Railway Budget 2005-06. President of the Federation of Indian Chambers of Commerce and Industry (Ficci) Onkar S. Kanwar described as “innovative” the reforms initiated by the Railway Minister, which will make the Railways “a much more freight customer-friendly organisation”. The schemes to attract a greater share of freight through private-public partnership will allow the industry to use the available Railway infrastructure optimally. Improvement in railway efficiency through better utilisation of existing rolling stock, user-friendly freight operating system and reforms in the railway accounting system are all conceived as a pre-requisite to the commercialisation of the Railways, he said. Mr Kanwar lauded the move to allow private organisations to run container trains and hoped that the proposal to run such trains would get the same facilities and treatment as those accorded to Concor. The Railway Minister has attempted a major rationalisation of the norms for classification of freight tariff, the exact cost implications of which for specific industries could be assessed only after a careful study of the new classification regime. The Ficci chief said there are other positives in the Railway Budget such as the wagon investment scheme which would give dedicated rail users some certainty as regards the availability of wagons. President of PHDCCI K. N. Memani, however, said the Budget has failed to carve out a strategy for long-term investments through generation of internal surplus for investment purposes. “Given the fact, that railways are the only high capacity transport mode that can meet the long-term growth need of our large economy, strategic measures to capture a substantially larger share of the growing goods traffic and Railway’s entry into a renewed growth phase are missing,” Mr Memani said. An attempt has been made to rationalise goods tariff structure by merging of various classes of commodities, to bring them down from 4000 to 80. However, its implications on the industry are not clear. Freight on many goods may go up and on some it may come down. The Railway Budget has not clearly spelt out revenue implications of this move, he said. The Railways earned 62 paise of each rupee from freight charges during 2003-04 and 30 paise from the movement of passengers. According to the Railway Budget presented today, the ministry spent 2 paise towards development fund of Railways in 2003-04. It spent a meagre 3 paise on special safety. The ministry continues to spend 30 paise of each rupee earned on paying wages and allowances to its staff. The fuel took away 17 paise while 14 paise were spent on catering to the pension fund. 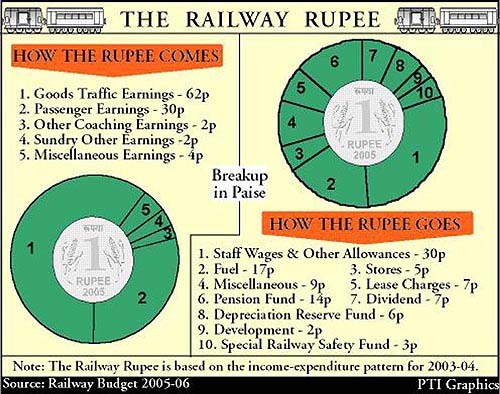 Railways spent 7 paise of each rupee earned towards payment of lease charges and same amount towards payment of dividend. An expenditure of 6 paise was incurred towards depreciation reserve fund and 5 paise towards maintenance of stores besides miscellaneous expenses of 9 paise during 2003-04. The ministry earned 30 paise from the movement of passengers across the country. Other streams of earnings for the Railways include 2 paise each from coaching and sundry avenues while 4 paise came from miscellaneous heads. Railway Budget 2005-06 has proposed 75 per cent concession in second class fares for girls from rural areas studying in government schools to enable them to attend national-level entrance examination for medical, engineering and other professional courses in colleges. In addition, 50 per cent concession in second class fares has been proposed for farmers and milk producers to enable them to travel to institutes for the purpose of training and learning better agricultural practices. Government rural school students can also avail themselves of 75 per cent concession in second class fares, once in a year, for study tour. The existing scheme of full concession in second class fare for unemployed youth travelling to appear in interviews of Central government jobs, has now been extended to interviews of state governments also. Moreover, the bodies of patients who die while undergoing treatment in major government hospitals will be carried on a priority basis, to the nearest rail head connecting their home town at 50 per cent concession of the normal tariff rates. Persons stranded during natural disasters would now get free second class transportation. It has also been proposed that in notified cases of national calamities and disasters, the transportation of the relief material will be carried on priority and free of cost. The recent amended rules for delayed or cancelled flights by the European Commission (EC) are likely to cause a further turmoil in the airlines industry. According to the new rules, the passengers flying into and out of European countries are entitled to heavy compensation in cash and kind for the inconvenience caused to them for delayed and cancellation of flights. The quantum of compensation is so heavy that many airlines will not be able to pay it. Aviation observers emphasise that awarding compensation for delayed or cancelled flights owing to technical snag is injudicious. Since the introduction of rules on February 17, 2005, several petitions are pending in the courts of European countries. But by the time, they are heard and disposed of, much damage would have been done to the industry, which is already passing through a difficult phase. In view of heavy quantum of compensation, many airlines are comtemplating increasing fares to offset the burden. On February 23 at Delhi, a passenger complained of noticing two rats on the Lufthansa flight (LH 761) when the plane was taxing for runway. A drunkard passenger was difficult to handle for passengers and crew. He caused further commotion in the cabin. The flight was delayed for hours. Had these twin incidents taken place in any European country, the 300 passengers could have claimed compensation for the delay in flight. What was Lufthansa’s fault in any of these two incidents? Lufthansa officials said that they did not find any rat despite a vigorous search. The drunkard passenger could be off-loaded only after the embassy official made it to the airport. Private Indian operators are scheduled to fly to European countries. Air-India has been flying regularly on several European routes. There will be chaos if they are ‘caught’ for delayed flights. We have ancestral agriculture land in our village in Haryana, which was in the name of our grandfather (who expired in 1967) and has recently been transferred in the names of our father and uncles as per their share. My father is now selling that land, and wants to equally distribute the proceeds among us - two brothers and three sisters. I want to know the status of the money so received by me/us. Whether this will be tax-exempt being central agriculture land or will it carry any tax obligations and, if any, what are these tax obligations and what are way out to minimise the tax, if any? A: Agricultural land situated within 8 km of the local limits of any municipality, notified area committee, town committee or a cantonment board and which has a population of not less than 10,000 is considered a capital asset. Consequently, sales made of such lands situated within the limits would attract tax as capital gains. [CIT v Shubhlata & Others 13TCR91 (1998)]. Based on the above definition, if the land is liable to capital gains — If your father sells it himself, he will have to pay the tax and the amount distributed will not be taxed. If he transfers it first in your names, in the ratio of your shares and then you sell it, the tax will have to be paid by each one of you. What is preferable will depend upon the individual income of each one of you and the cost of transferring the land in your names. Q: I am a mutual fund investor and I have some anxieties. I hold these with my family members on an as is basis. My deposits are small and withdrawals less than Rs 100,000 Do I need a UIN for operating the a/c If yes, then do all holders have to appear for the fingerprinting etc. My son is in the USA and cannot come for this work If after April 1, the orders take force and I am unable to get a UIN, will I be able to close my accounts? A: As of now, my understanding is that UIN is not needed unless any one of the transactions (sale as well as purchase) you indulge in after 31.3.05 exceeds Rs 1 lakh. Therefore, it follows that if the withdrawals are lesser than Rs 1 lakh, UIN may not be applicable. However, note that the matter is not very clear so far and in time to come, we will get increased clarity. Q: What are the tax benefits available to equity-oriented MF schemes? 2. There is no dividend distribution tax. 3. The long-term capital gains is exempt. 4. The short-term capital gains enjoys the concessional flat rate of tax @10%. It is also true that under the current scenario, the growth has an advantage over dividend-paying schemes. Q: I had made some payments regarding some property transactions from my NRE account. But the deal did not go through and the party concerned refunded the amount. I am told that this amount can be credited only to an NRO account, which is taxable. Since there is no wealth gain or income earned in this case, how can I prevent the bank from deducting the tax ? A: No, there would not be any tax on this amount. You have been misinformed regarding the same. In terms of RBI Master Circular No. 4 / 2004-05 dated July 1, 2004, authorised dealers (banks) may permit repatriation of amounts representing the refund of application/earnest money/purchase consideration made by the house building agencies/seller on account of non-allotment of flat/plot/cancellation of bookings/deals for purchase of residential/ commercial property, together with interest, if any (net of income tax payable thereon), provided the original payment was made out of NRE/FCNR account of the account holder, or remittance from outside India through normal banking channels and the authorised dealer is satisfied about the genuineness of the transaction. Such funds may also be credited to the NRE/FCNR account of the NRIs/PIO, if they so desire.